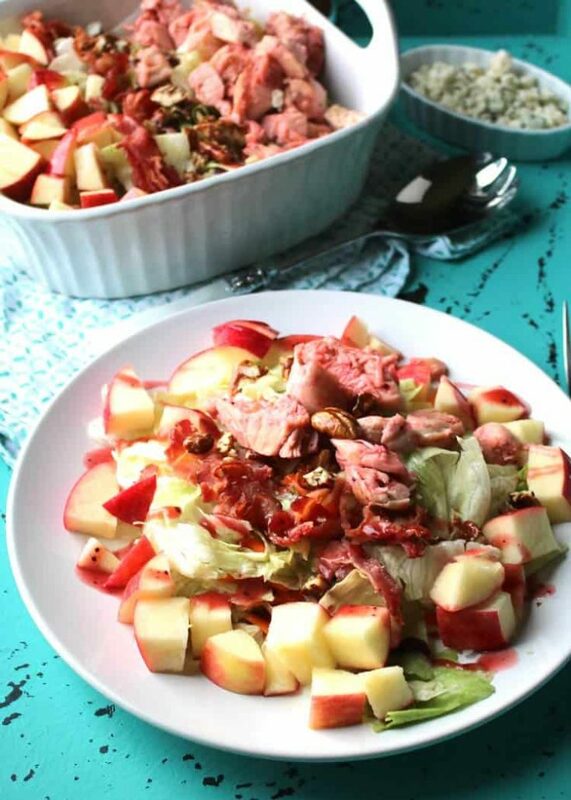 This fresh and tasty Apple Pecan Chicken Salad is a copycat version of the Cracker Barrel Applefest Grilled Chicken Salad. No matter if you’ve had the original, you’ll love this one! Sometimes it can be a little tough to get in the recommended 2 1/2 cups of vegetables a day, so when you find a recipe that makes you love salad, it’s a keeper. This recipe will definitely make you love salad and it’s definitely a keeper. Picture this for a minute: bites of crisp, mixed lettuce, flavorful grilled chicken, candied pecans, crispy bacon, crumbled blue cheese, sweet and crunchy apple chunks, all tossed in a sweet and fruity salad dressing. Sounds amazing, doesn’t it? 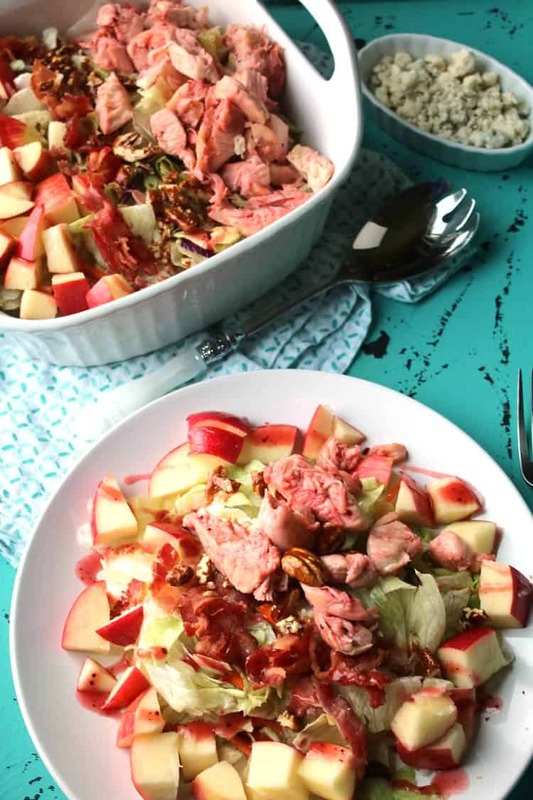 There is so much to love about this Apple Pecan Chicken Salad that it’s hard to come up with just one thing! The great part about this salad is it’s so easy to recreate at home. Easy to recreate and you save some money. Not bad! I don’t know about you, but whenever I order a grilled chicken salad at a restaurant, I brace for the worst. Even though I know there are winners out there like this salad, I’ve had far too many encounters with a dry, flavorless chicken breast plopped on top of the salad that just ruins the whole thing. I don’t want a dry, flavorless chicken breast on a grilled chicken salad (who does?). I want a tender, bursting-with-flavor chicken breast that complements the rest of the salad ingredients. Throwing a plain chicken breast on the grill or heating up a previously frozen chicken breast just won’t cut it. Don’t worry; the grilled chicken breast you use in this Apple Pecan Chicken Salad won’t be dry or flavorless. Why? Because you’ll marinate it overnight in raspberry-walnut dressing before you grill it. The result is a tender, sweet, and flavorful chicken breast that holds its own against the other ingredients (even those mouthwatering glazed pecans!). There are several popular brands of raspberry-walnut dressing that you should be able to find in just about any grocery store. However, if you want to try a different sweet dressing as your marinade, go for it! This salad can be made into a large party salad. Serve all ingredients buffet style and let guests build their salad to their liking. Don’t forget to brush the apple slices in lemon juice to keep them from browning. You can serve it with dressing other than raspberry-walnut dressing. Although you marinate the chicken in raspberry-walnut dressing, this salad goes great with an apple cider vinaigrette or a different fruity, sweet dressing. You’ll probably want it every day. It’s really that good! I promise it will become a household favorite, even among the pickiest salad eaters in your family. 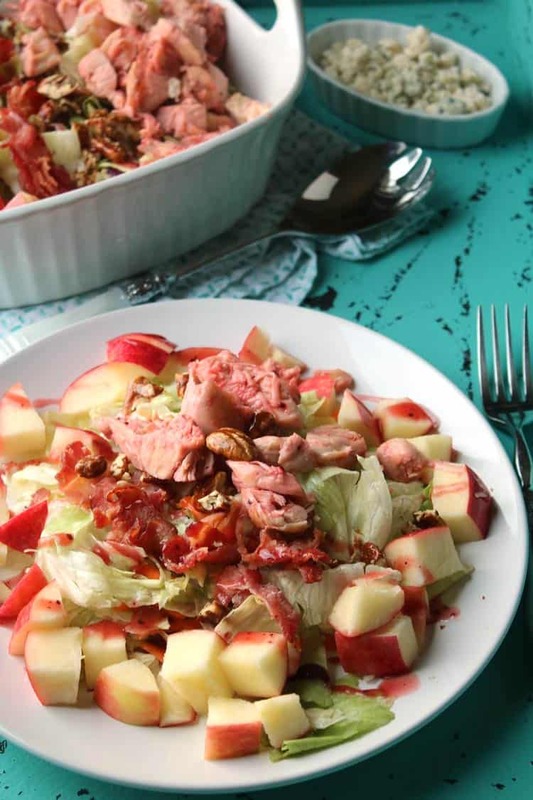 Give this copycat Cracker Barrel salad a try. You’ll love it! 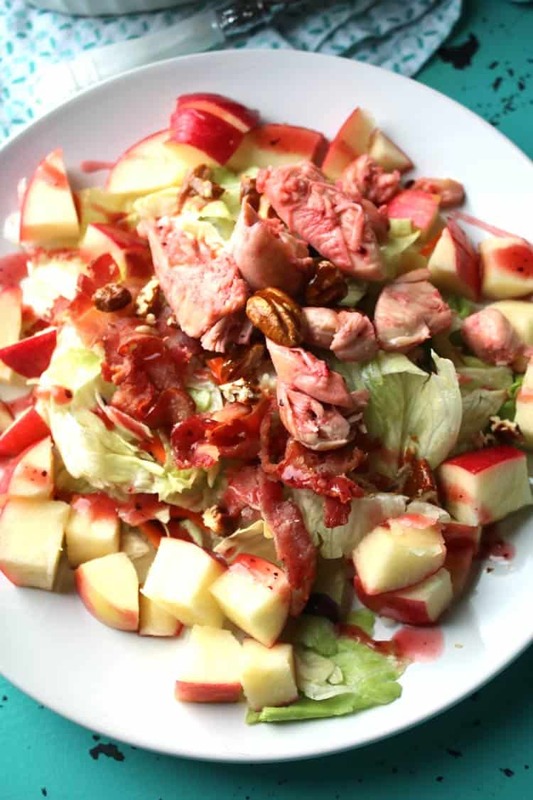 This Apple Pecan Chicken Salad will make you love salad! Pour 1/2 cup of raspberry-walnut salad dressing into a Ziplock-style bag. Add the chicken, seal, and shake the bag until the dressing has evenly coated the chicken. Refrigerate overnight. When you're ready to make the salad, grill the chicken and make sure it's cooked through, Thinly slice chicken and set it aside while keeping it warm. Divide salad between two plates, and then place the apple chunks in a decorative ring along the outer edge of each plate, apple skin facing outward. Top salad with pecans. Add chicken slices in the center and sprinkle with crumbled blue cheese. On top of the blue cheese, crumble or break the bacon Top the salad with nuts. Placing the chicken slices in the center, sprinkle blue cheese crumbles over the top. Break or crumble the bacon, whichever is your preference. Serve with either an apple cider vinaigrette or another sweet, fruity salad dressing in a cup on the side.